The oil giant's request is being reviewed by the Trump administration and is certain to draw extra scrutiny because it involves a company formerly run by Secretary of State Rex Tillerson, who cultivated close ties with Russia and its president, Vladimir Putin. The drilling venture was blocked when the U.S. imposed sanctions on Russia in 2014. Exxon applied to the Treasury Department for a waiver from the sanctions in 2015, during the Obama administration, according to the person, who spoke anonymously because the application process is confidential. Exxon has publicly disclosed licenses for other work in Russia that required waivers. An Exxon spokesperson said the company declined to comment on ongoing issues. The Treasury Department, which would handle Exxon's application to drill around the Black Sea, did not respond to a request for comment. 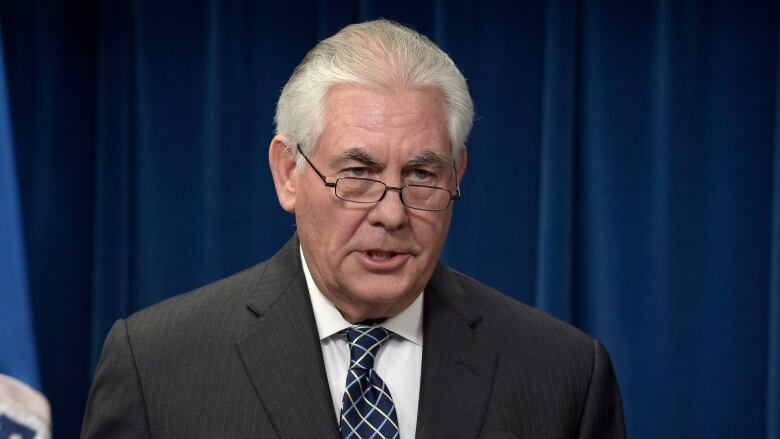 A State Department spokesperson said Tillerson has recused himself from any matters involving Exxon for two years and is not involved with any decision involving the company before any government agency. Tillerson retired as Exxon CEO at the end of last year. He has known Putin for about two decades — the Russian president awarded Tillerson a special honor in 2013. Irving, Texas-based Exxon disclosed in regulatory filings in 2015 and 2016 that it received three licences from the Treasury Department's Office of Foreign Assets Control to conduct "limited administrative actions" with Rosneft. The company said it was complying with all sanctions regarding investments in Russia. The sanctions were imposed after Russia annexed the Crimea region of Ukraine in 2014. Among other things, U.S. companies were prohibited from transferring advanced technology used to drill offshore and in shale formations. Exxon was ordered to stop drilling in the Kara Sea off Russia's northern coast. The head of Exxon's Russian partner, Rosneft, was personally blacklisted. As Exxon CEO, Tillerson opposed the sanctions, telling shareholders in 2014 that sanctions were usually ineffective and caused "very broad collateral damage." Tillerson and Exxon agreed to the venture with Rosneft in 2011. The Russia sanctions have cost the company hundreds of millions of dollars. Exxon reported in 2015 that its potential losses related to the Rosneft venture could run to $1 billion. If the sanctions are lifted Exxon could push ahead with lucrative exploration and production opportunities in the Black Sea, Siberia and the Russian Arctic. Exxon's ambitions could be complicated, however, by concern over what U.S. intelligence agencies have concluded were Russian cyberattacks to interfere with the U.S. presidential election last year. Congress is also investigating possible ties between aides to then-candidate Donald Trump and Russian officials. Exxon's critics said that if the Trump administration approved Exxon's request, which was reported first by The Wall Street Journal, then Congress should block it on environmental and national-interest grounds. A Greenpeace official, Naomi Ages, said approving Exxon's request to drill in the Black Sea would give momentum to drilling in the Arctic and "would also send a message to Russia that it can intervene in any country, including the United States, with no consequences." Will Tillerson's Russian Order of Friendship pay dividends in Syria talks?